DES MOINES, IA – Iowa Barnstormers Head Coach and Director of Football Operations Mike Hohensee made his biggest move to date this offseason when he announced Monday afternoon that the team has been assigned Quarterback J.J. Raterink. 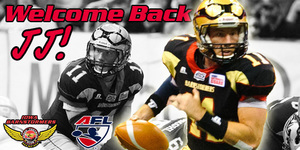 The veteran signal caller has agreed to a two-year contract that will keep him a Barnstormer through the 2014 season. Raterink (6-2, 210) joined the Barnstormers prior to the 2012 season. His performance was nothing short of spectacular, throwing for 4,870 yards and 93 touchdowns. He broke numerous team records and was named Barnstormers MVP by his fellow players and coaches. Raterink’s TD-INT ratio of 93-9 was best in the AFL. The 2013 season will be Raterink’s seventh playing Arena Football. Prior to joining the Barnstormers, Raterink spent time with the Kansas City Command (2011), Chicago Rush (2010-11) and the Quad City Steamwheelers (af2; 2007-09). Everywhere he went he became an immediate starter and had a great impact. Raterink played college football for four seasons at the University of Wyoming from 2001-04. “I’m thrilled to be returning to the Barnstormers for two more seasons”, stated Raterink. “I’m excited to see what kind of progress we can make this season, and I assure you we will never stop trying until we bring a championship home to the best fans in Arena Football.” Raterink will join a group of 35 players for Barnstormers training camp which will begin in March of 2013. Season tickets for the 2013 Iowa Barnstormers season remain on sale now for as little as $99.00 per seat. Season tickets make a great gift for the football fan in your family. So, don’t miss a minute of the action this season! To order your seats or for more information, call the Barnstormers at (515) 633-2255,or log onto www.theiowabarnstormers.com.